In the main chamber, which houses the iconic Lincoln statue looking eastward toward the Washington Monument, an aerial work platform provided vantage points for collecting data on Lincoln’s head and the upper surfaces of his arms. 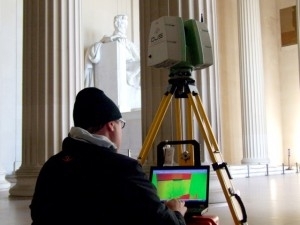 (Our initial idea to physically climb onto Mr. Lincoln’s lap to utilize hand-held scanners was prohibited by the NPS). Jon W. Adams, Director of Architectural and Heritage Services can be reached at 215-659-2010 or via email at experts@forensicDJS.com.